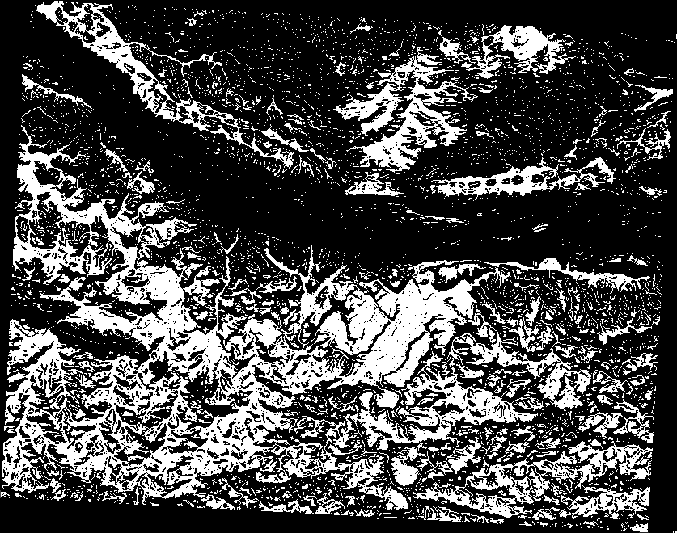 Certain types of rasters allow you to gain more insight into the terrain that they represent. Digital Elevation Models (DEMs) are particularly useful in this regard. In this lesson you will use terrain analysis tools to find out more about the study area for the proposed residential development from earlier. 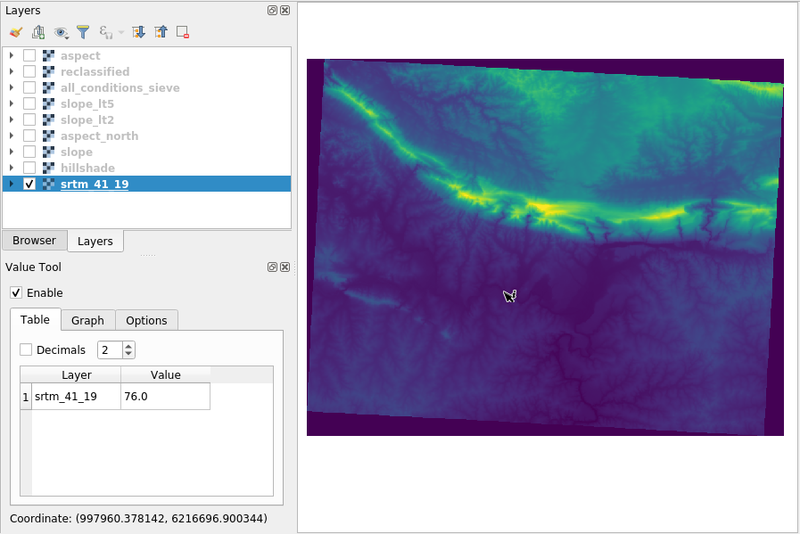 The goal for this lesson: To use terrain analysis tools to derive more information about the terrain. We are going to use the same DEM layer as in the previous lesson. If you are starting this chapter from scratch use the Browser panel and load the raster/SRTM/srtm_41_19.tif. 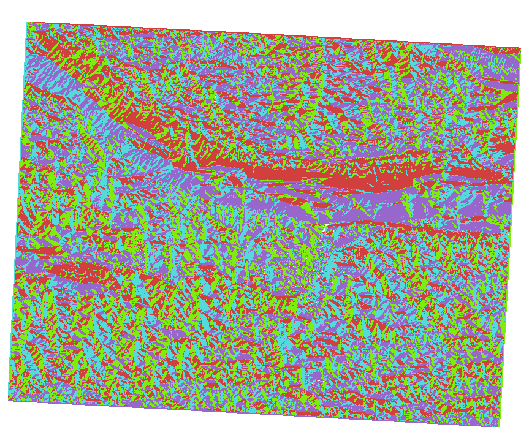 The DEM layer shows you the elevation of the terrain, but it can sometimes seem a little abstract. It contains all the 3D information about the terrain that you need, but it doesn’t look like a 3D object. 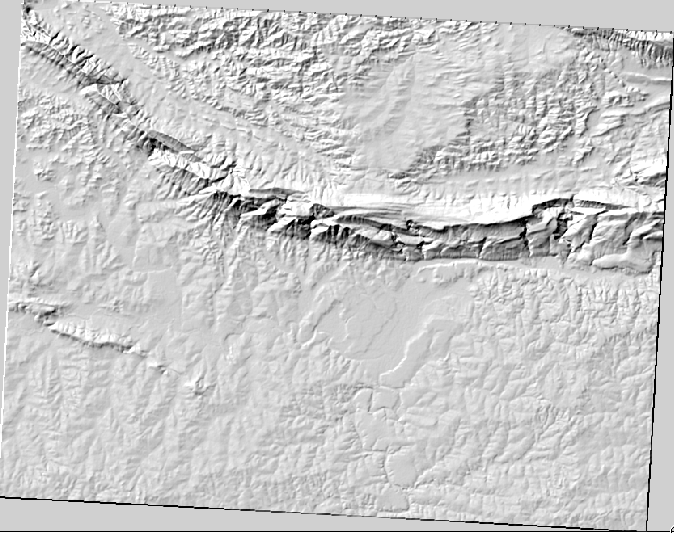 To get a better look at the terrain, it is possible to calculate a hillshade, which is a raster that maps the terrain using light and shadow to create a 3D-looking image. 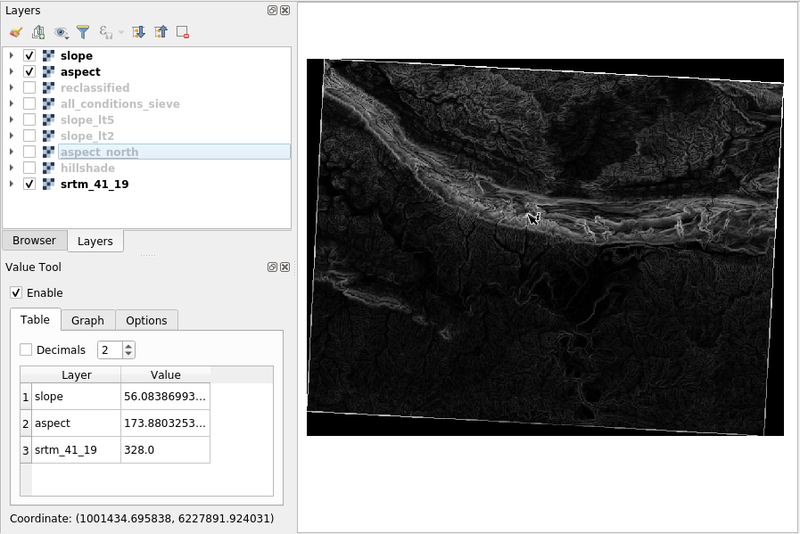 We are going to use algorithms of Raster ‣ Raster terrain analysis menu. That looks nice and 3D, but can we improve on this? On its own, the hillshade looks like a plaster cast. Can’t we use it together with our other, more colorful rasters somehow? Of course we can, by using the hillshade as an overlay. 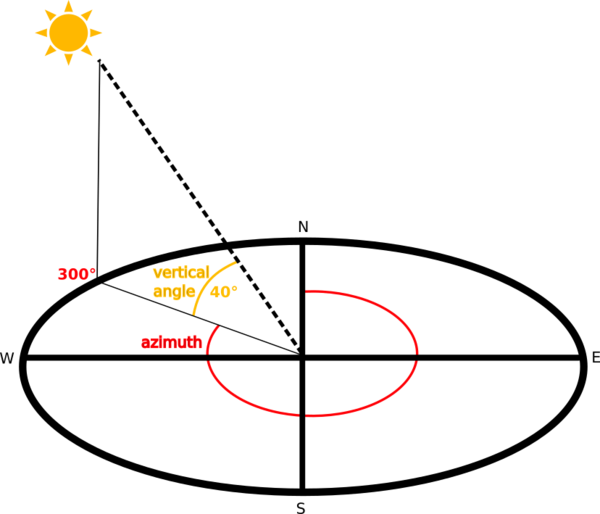 A hillshade can provide very useful information about the sunlight at a given time of day. But it can also be used for aesthetic purposes, to make the map look better. The key to this is setting the hillshade to being mostly transparent. Set the Global opacity to 50%. Switch the hillshade layer off and back on in the Layers panel to see the difference it makes. Using a hillshade in this way, it’s possible to enhance the topography of the landscape. If the effect doesn’t seem strong enough to you, you can change the transparency of the hillshade layer; but of course, the brighter the hillshade becomes, the dimmer the colors behind it will be. You will need to find a balance that works for you. Remember to save the project when you are done. Another useful thing to know about the terrain is how steep it is. If, for example, you want to build houses on the land there, then you need land that is relatively flat. 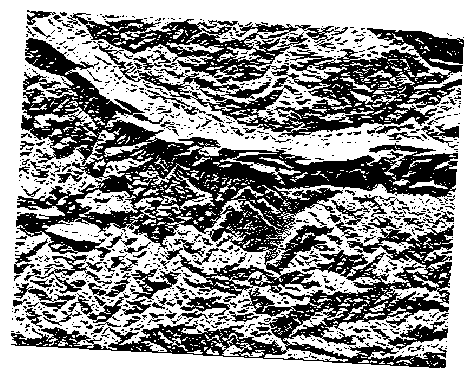 To do this, you need to use the Slope algorithm of the Processing ‣ Raster terrain analysis. Aspect is the compass direction that the slope of the terrain faces. An aspect of 0 means that the slope is North-facing, 90 East-facing, 180 South-facing, and 270 West-facing. Since this study is taking place in the Southern Hemisphere, properties should ideally be built on a north-facing slope so that they can remain in the sunlight. 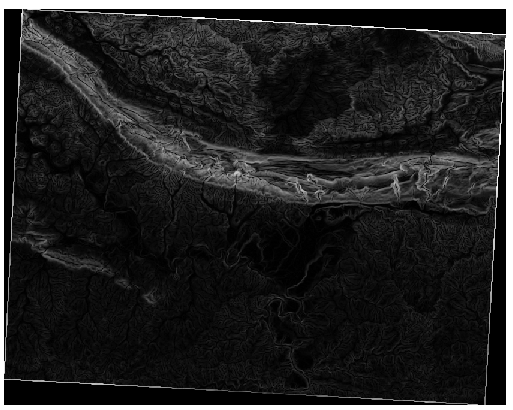 Use the Aspect algorithm of the Processing ‣ Raster terrain analysis to get the layer. Think back to the estate agent problem, which we last addressed in the Vector Analysis lesson. Let’s imagine that the buyers now wish to purchase a building and build a smaller cottage on the property. In the Southern Hemisphere, we know that an ideal plot for development needs to have areas on it that are north-facing, and with a slope of less than five degrees. But if the slope is less than 2 degrees, then the aspect doesn’t matter. Fortunately, you already have rasters showing you the slope as well as the aspect, but you have no way of knowing where both conditions are satisfied at once. How could this analysis be done? The answer lies with the Raster calculator. Each tool is leading to the same results, but the syntax may be slightly different and the availability of operators may vary. 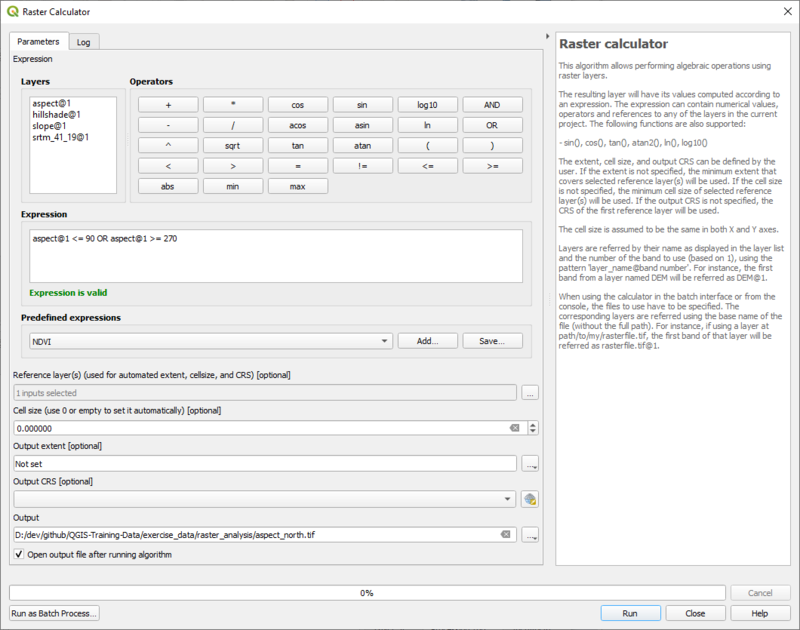 We will use Processing ‣ Raster Analysis ‣ Raster calculator. Open the tool by double clicking on it. 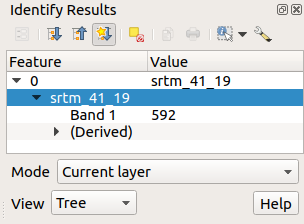 The upper left part of the dialog lists all the raster layers loaded in the legend as name@N where name is the name of the layer and N is the raster band used. In the upper right part you will see a lot of different operators: stop for a moment to think that a raster is an image, you should see it as a 2D matrix filled with numbers. You have now to set up the raster details, like the cell size, extent and CRS. This can be done manually by filling or it can be automatically set by choosing a Reference layer. 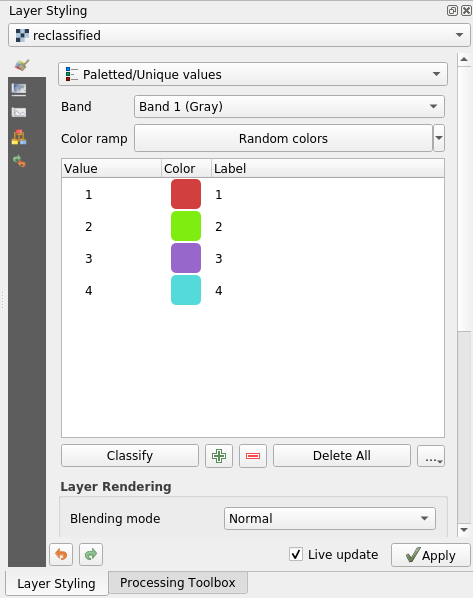 Choose this last option by clicking on the … button next to the Reference layer(s) parameter. In the dialog, choose the aspect layer because we want to obtain a layer with the same resolution. Save the layer as aspect_north. 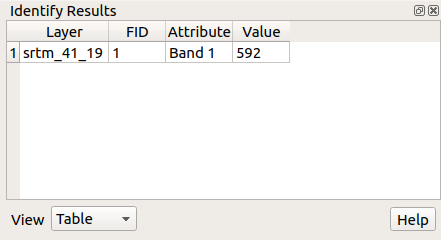 The output values are 0 or 1. What does it mean? The formula we wrote contains the conditional operator OR: therefore the final result will be False (0) and True (1). Now that you’ve done the aspect, create two separate new analyses of the DEM layer. The first will be to identify all areas where the slope is less than or equal to 2 degrees. The second is similar, but the slope should be less than or equal to 5 degrees. Save them under exercise_data/raster_analysis as slope_lte2.tif and slope_lte5.tif. Where the conditions of these layers are met, they are equal to 1. Elsewhere, they are equal to 0. Therefore, if you multiply one of these rasters by another one, you will get the areas where both of them are equal to 1. The conditions to be met are: at or below 5 degrees of slope, the terrain must face north; but at or below 2 degrees of slope, the direction that the terrain faces in does not matter. Therefore, you need to find areas where the slope is at or below 5 degrees AND the terrain is facing north, OR the slope is at or below 2 degrees. Such terrain would be suitable for development. As you can see from the image above, the combined analysis has left us with many, very small areas where the conditions are met. But these aren’t really useful for our analysis, since they’re too small to build anything on. Let’s get rid of all these tiny unusable areas. Set the Input file to all_conditions, and the Sieved to all_conditions_sieve.tif (under exercise_data/raster_analysis/). Set both the Threshold to 8 and check Use 8-connectedness. Once processing is done, the new layer will load into the canvas. What’s going on? The answer lies in the new raster file’s metadata. Whereas this raster, like the one it’s derived from, should only feature the values 1 and 0 while it has also a very large negative number. Investigation of the data shows that this number acts as a null value. Since we’re only after areas that weren’t filtered out, let’s set these null values to zero. This will maintain all existing zero values, while also setting the negative numbers to zero; which will leave all the areas with value 1 intact. Save the output under exercise_data/raster_analysis/ as all_conditions_simple.tif. This is what was expected: a simplified version of the earlier results. Remember that if the results you get from a tool aren’t what you expected, viewing the metadata (and vector attributes, if applicable) can prove essential to solving the problem. We use the Raster calculator tool to make some calculation on raster layer. There is another powerful tool that we can use to better extract information from existing layers. This operation could be achieved with the raster calculator but the formula would become very very large. 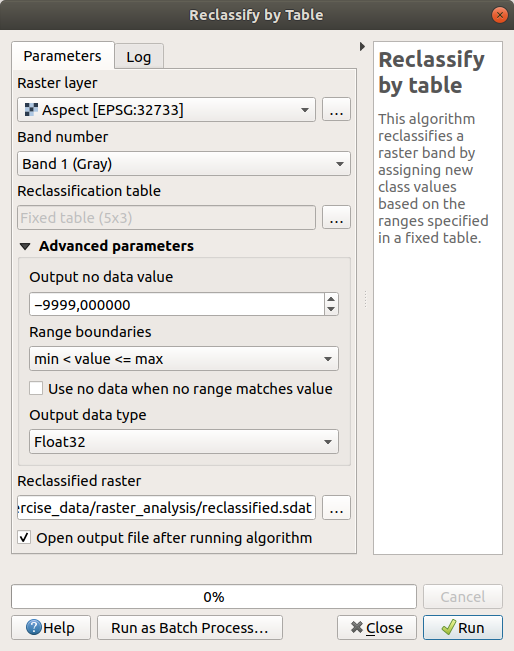 The alternative tool is the Reclassify by table tool within Processing ‣ Raster analysis. Click on the … of the Reclassification table parameter. A table like dialog will pop up where you can choose the minimum, maximum and new values for each class. The method used by the algorithm to treat the threshold values of each class is defined by the Range boundaries parameter. If you compare the native aspect layer with the reclassified one, there are not big differences. But giving a look at the legend you can see that the values go from 1 to 4. Let’s give this layer a better style. With this reclassification and the paletted style applied to the layer you can immediately see the aspect areas. Cool isn’t it?! Unlike vectors, raster layers don’t have an attribute table: each pixel contains one or more numerical values, depending if the raster is singleband or multiband. 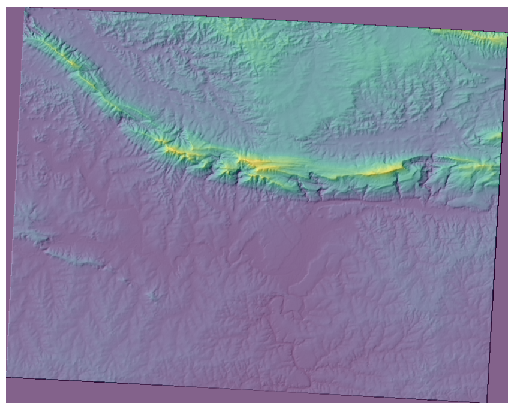 All the raster layers we used in this exercise are made by just a single band: depending on the layer, pixel numbers will represent elevation, aspect or slope values. How can we query the raster layer to know the value of a single pixel? We can use the button to extract this information. Clicking each pixel to get the value of the raster could become annoying after a while. We can use the Value Tool plugin to solve this problem. 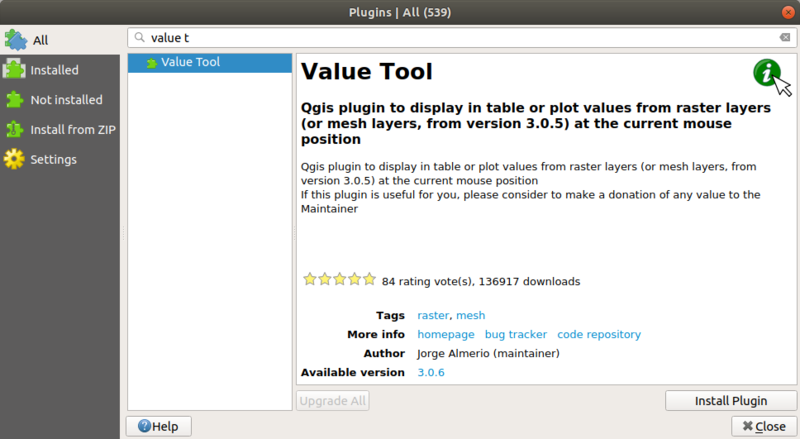 Select the Value Tool plugin, press Install Plugin and then Close the dialog. The new Value Tool panel will appear. If you close the panel you can reopen it by enabling it in the View ‣ Panels ‣ Value Tool or by clicking on the new icon of the toolbar. To use the plugin just check the Enable checkbox and be sure that the srtm_41_19 layer is active (checked) in the Layers panel. You’ve seen how to derive all kinds of analysis products from a DEM. These include hillshade, slope and aspect calculations. You’ve also seen how to use the raster calculator to further analyze and combine these results. Finally you learned how to reclassify a layer and how to query the results. Now you have two analyses: the vector analysis which shows you the potentially suitable plots, and the raster analysis that shows you the potentially suitable terrain. How can these be combined to arrive at a final result for this problem? That’s the topic for the next lesson, starting in the next module.